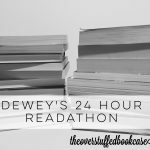 Well, I got up a bit late today and then took a while to actually feel awake, then I ate some breakfast and wrote this post, so I won’t actually be starting the Readathon until we’re well into hour 4. But that’s okay. I just realized that my entire pile is made up of books that have been out for a while, and I’m one of the last bloggers to finally get around to them! Well, better late than never! 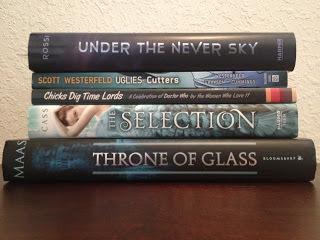 My goals are to finish Under the Never Sky, read Uglies: Cutters, and at least get started on another book. Hmm, I don’t know! I’ve wanted to read all of them for a long time! Well, I’m a stay at home mom with a 3 1/2 year old son and I love to read (obvs) and write and one day I’d love to have a YA novel published. ALSO: I’m going to BEA in a month! Yay! If you’re a book blogger, and you’re going too, be sure to check back here soon–a gathering for all book bloggers is being planned as we speak! I’ll have more info here soon! I hope to actually read a lot of books today. I’m a slow reader and so I keep my goals pretty small, but I hope to find a nice pace and get a lot read today! Good luck to everyone who’s participating! I will respond to any comments left today, but I’m so behind already on that as it is, so it might take me a while, but I’ll get to it! 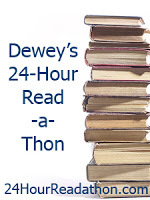 Dewey’s 24-Hour Read-a-Thon: Let’s Get This Party Started! Since I cannot participate today I will send you all my reading speed! I love the selection and I am hopefully starting the elite today, Enjoy! Don't feel bad, I haven't read any of those books yet, either! I wish I were reading/blogging in Oklahoma! I lived in Lawton about 15 years ago. Now I'm in Korea. Big difference. Why do you always forget to plan snacks! That is the best part! I think I'm going to plan my own mini readathon for the first Tuesday or Thursday when I don't have to go to class. I haven't even decided for sure what day I'll be doing my own personal readathon…but I know what snacks I'll have! This is so fun, I'm hoping on participating next time. I'd pick short books because I'm also a slow reader and I know I'd probably wouldn't even finish one if I chose long books.